Your Gi is your karate uniform, in the Shito-ryu Shukokai Union we wear only pure White Gi’s made from a strong canvas like cotton, all double or triple stitched for strength. 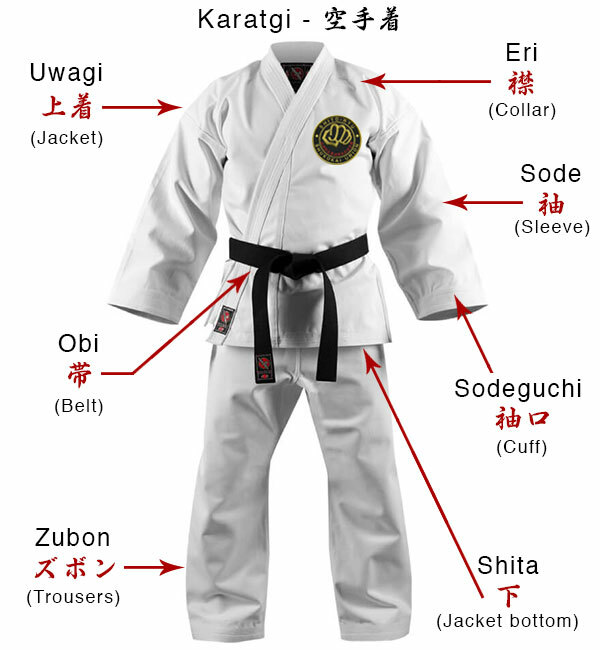 A karategi is somewhat similar to a judogi (Judo uniform) as it shares a common origin; however, the material and cut of the uniform is generally much lighter and looser fitting. 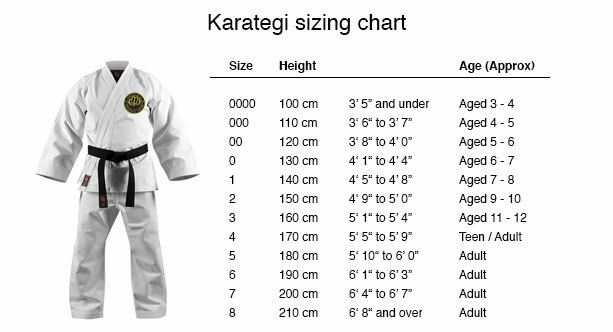 The heaviest of Karategi's are only 0.5 kg (16 oz) compared to some judogi at 1 kg (35 oz). Because of the nature of Karate training which emphasizes striking, kicking and a more limited range of standing throws compared to Judo the karategi has evolved in a manner that maximizes mobility and speed without the extremely coarse and strong fabric required for grappling and throwing found in Judo. They are made from smooth cotton which may be brushed or ribbed for unrestricted movement and added comfort. Reinforced stitching is common, as to compensate for the stresses put on the gi. Most quality karategi are cut from a light canvas style cloth because of its ability to stand up to considerable amounts of rigorous application and abuse without restricting the mobility of the karateka. 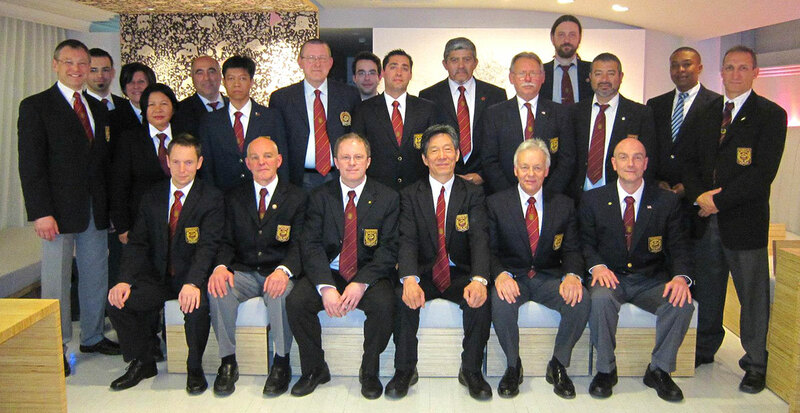 Typically, such karategi weigh at least 0.3 kg (10 oz). The weight of the material helps Karateka determine how rigid the suit will be. 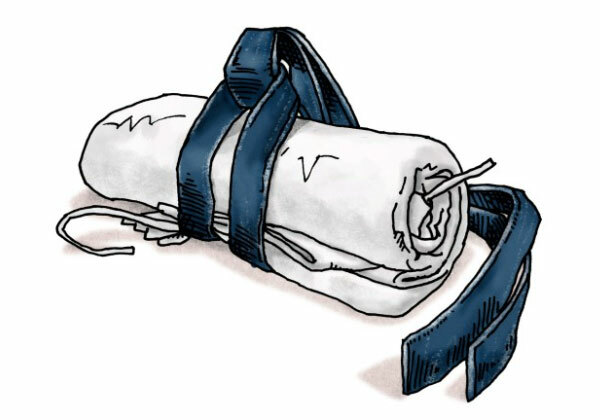 0.34 kg (12 oz) or 0.40 kg (14 oz) cotton canvas is standard, although some manufacturers offer 0.45 kg (16 oz) materials. It is not unusual for a martial artist to feel better cooled when using a heavier karategi, compared to the cheaper karategi. Naturally, heavier suits will be more rigid. This rigidity increases ventilation within the suit. The heavier gi also has a more pronounced sound when a move is executed. Despite the extra weight of the heavier fabrics, most experienced practitioners prefer them due to their durability, and the ability of the thicker fabric to wick away perspiration. The three main cuts of karate gi are Kata, European and Japanese. The Japanese cut has short sleeves and trousers for less restriction. This cut also has a longer lapel that prevents it from riding up over the belt (obi). The Kata cut is very rare. It has even shorter sleeves and is chosen more for aesthetic appeal. European cut has longer sleeves and trouser. The lapel is shorter. This cut again is chosen for aesthetic appeal. 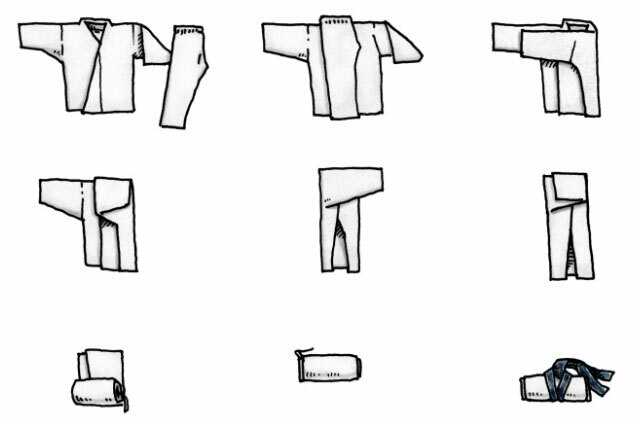 Different styles of Karate have slightly different uniforms though all share the same basic design, differing only in the lengths of sleeves, legs and the skirt of the uwagi (jacket). Many karateka tend to wear their obi (belt) much longer than judoka and other martial artists. There is a new style of Karategi now on the market developed partly by Jesse Encamp or "Karate by Jesse" and "The Karate Nerd" fame. 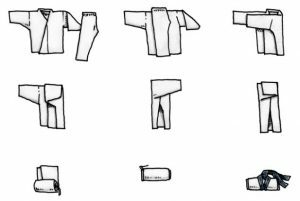 It is called the Seishin Gi and has many new unseen features that differ from the traditional Japanese Gi like air ventilation panels in jacket and pants, Okinawan high cut waist with quadruple loops and pleats, 3x thickness in sleeve and cuffs for a good snap, 9.5oz silky smooth cotton. The gi size is based on your height. Therefore, choose the size that best corresponds to your height (cm/feet/inches). If you are between two sizes, choose larger or smaller size depending on your personal preference. In this case, some people prefer to order a larger size and shrink it down with a hot wash. Because of the type of fabric used for gi's, they will/can shrink quite a lot and can be perfectly sized for you in this way. Your gi should be washed as cold as possible. This will ensure maximum longevity of your gi. Hot water scorches the delicate cotton fibre. Try to avoid commercial tumble dryers. Let your gi drip dry. (Note: if you want your gi to shrink, a hot wash will shrink it 2-5%. But try to avoid it regularly). As a cold wash may not get rid of odors or germs, an anti-germicide additive to the wash may help keep your gi fresh. Washing it regularly will help too. Do not iron your gi, it's almost wrinkle free. You can iron it if you really want to, but we don't recommend it. Ironing actually damages the gi's delicate cotton fibre. 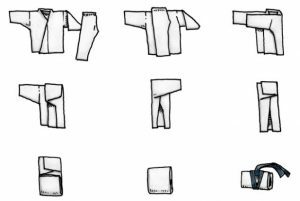 Just let it drip dry, then nicely fold your gi and train as usual - your body heat and sweat will naturally straighten out any creases once you start moving around. But if you have a special occasion coming up (i.e. grading, demonstration or competition) go ahead and bring out the iron. Put on your Gi top like you would a jacket. Ensure your right side flap is folded towards your left side first and tie the strings that are attached together. Then fold your left side flap to your right side tying the strings together. The end result is that your left side flap should be on the outside. If you have an association or style badge it will be mounted to "your" left breast pocket area, so this left-hand side of the gi jacket has to be on the top (See badge placement below for more information). 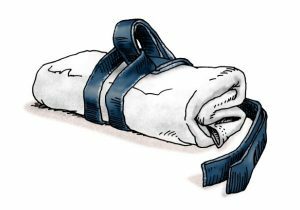 The second way is called “Maki no Gi” (rolled gi) and works best if you’re carrying the gi without a training bag. Put it gi in your training bag. Pick up your gi "bundle" with the belt tangs. Your obi (belt) symbolises your karate spirit and as such it should be treated with respect. Your obi’s colour indicates your karate rank. This act symbolises the importance of balance – both spiritual, technical and physical (known in Japanese as ‘Shin Gi Tai’) – but also that excellence in Karate can only be achieved when physical training is balanced with theoretical studies. This concept is known as ‘Bun Bu Ryo Do’; literary study and physical practice are united in the ‘Way‘. First fold the obi in half with both ends of the same length to locate its center. Place the centre of the obi flat across your stomach with both ends hanging down toward the floor. If your obi has any attendance stripes, place them on your left side. They will end up on your right side when you are finished tying your obi. 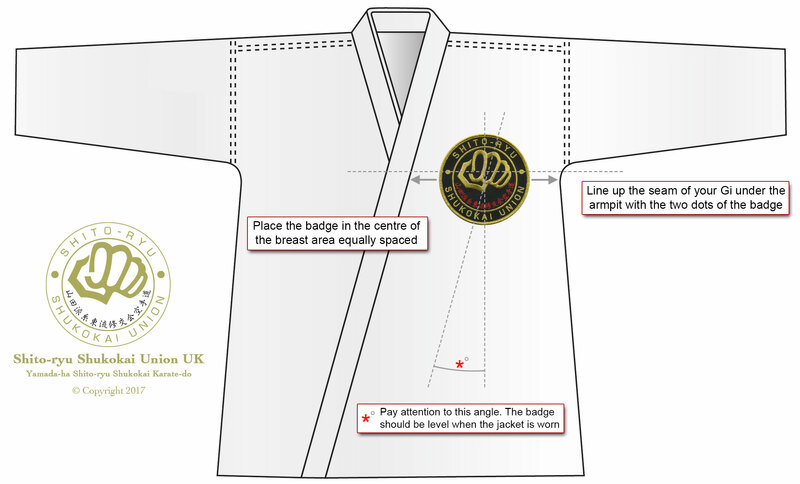 If your obi is a two coloured half-rank obi, such as gold and orange, place the colour of your next rank on the top and the colour of your previous rank on the bottom. So on a gold and orange obi that’s between orange and gold ranks, gold would be on the top and orange would be on the bottom. Keep the centre of your obi flat against your stomach with both ends of equal length. Wrap both ends around the sides of your waist from your front toward your back. Keep your obi flat against your stomach and sides. Take the end that’s on your left side and cross it over the end from your right side in the middle of your back. After the ends cross in the middle of your back wrap them across to the opposite sides. Remember to keep the obi flat against your body without letting it twist anywhere. 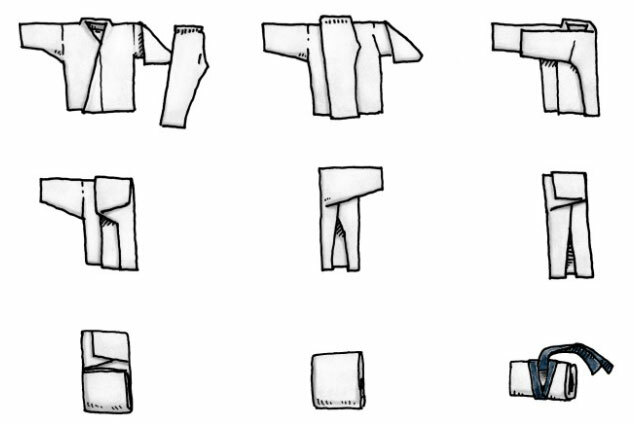 Now wrap both ends of your obi around the sides of your waist to return to your front again. Run your fingers along the obi all the way around your waist and smooth the belt in the back and around the sides so that it is doubled up and lies flat without any twists. The obi should lie flat against your back and sides as if it were a single belt made of two layers. Keeping the obi flat and doubled-up wrap both sides around front to cross on your stomach. The left side will be the inside layer laying flat against your stomach. The right side will be the outside layer laying flat against the layer beneath it. Where the obi crosses in the middle of your stomach, it will now be tripled up. Keep everything flat, as if it were a single belt with three layers on your stomach. Wrap the end that originates on your right side under the other two layers, against your stomach, and pull it straight up and out the top of your obi. Pull the two ends diagonally apart to tighten your obi around your waist. Take the end of your obi that is coming out of the top left, and bend it down over to the right side. Take the end of your obi that is coming out of the bottom right and pull it down to the centre. Take the end coming out the bottom and loop it under the other end, then up, over and back down through the loop it forms with the rest of the obi against your waist. Adjust if necessary to make both ends the same length, then pull the ends to tighten the knot. Well done, you now have a properly tied obi. The knot will look like a fortune cookie with a triangle pointing to your right. Both ends will be the same length. 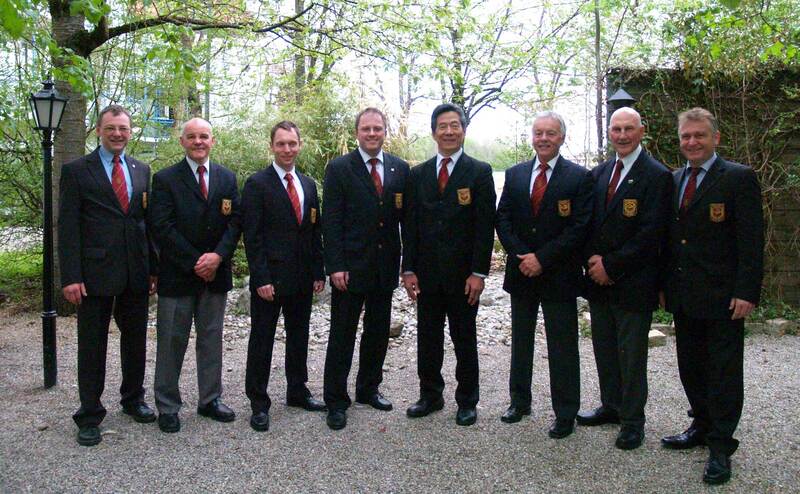 The official SSU Gi badge should be purchased only from either the Chief Instructor (Denis Casey) or an association instructor or representative. The badge is 4.5" (11.5cm) in diameter and should be placed on the left breast pocket area of the jacket as shown in the diagram. It should be firmly attached by sewing in place as iron-on backings are not secure enough whilst training. Place the badge horizontally in the centre of the breast area making sure that it is level when you will wear it as the overlap of the jacket isn't vertical. Try to align the two dots on the badge with the seam under the armpit when the sleeve is raised. The badge should sit level (in relation to the two dots on the badge) when the arms are down by the side, as say in a photograph. 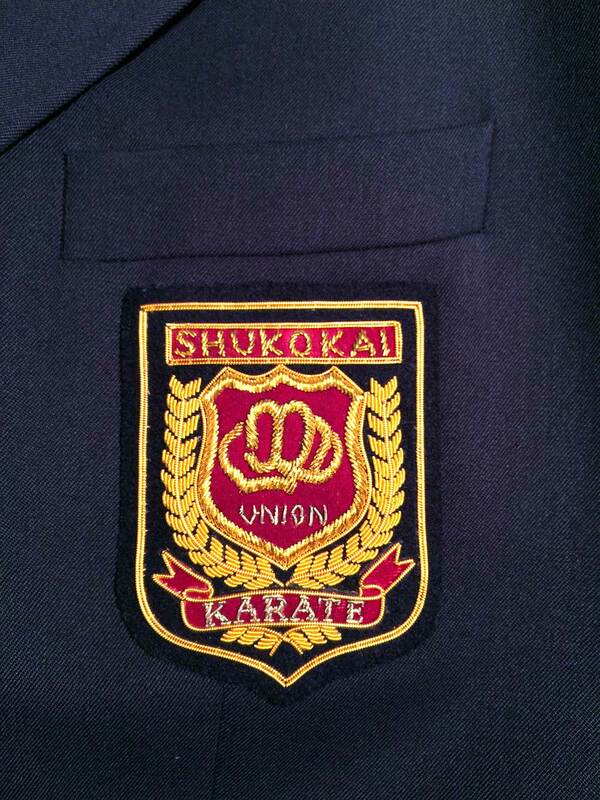 No other badges, logos or insignia should be added to your Gi unless agreed by the Chief Instructor of the association. 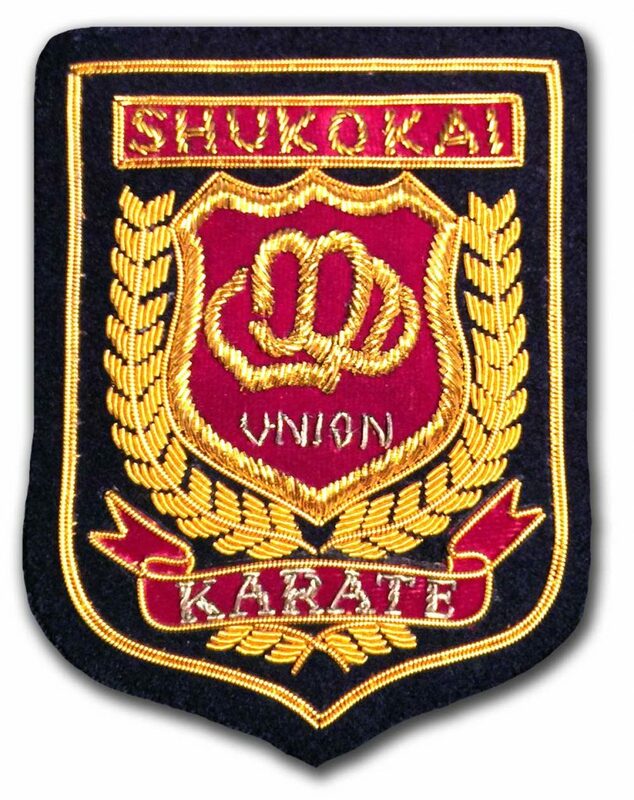 On many (but not all) occasions, members of the Shito-ryu Shukokai Union will be seen in their Gi's and in a Dojo environment. 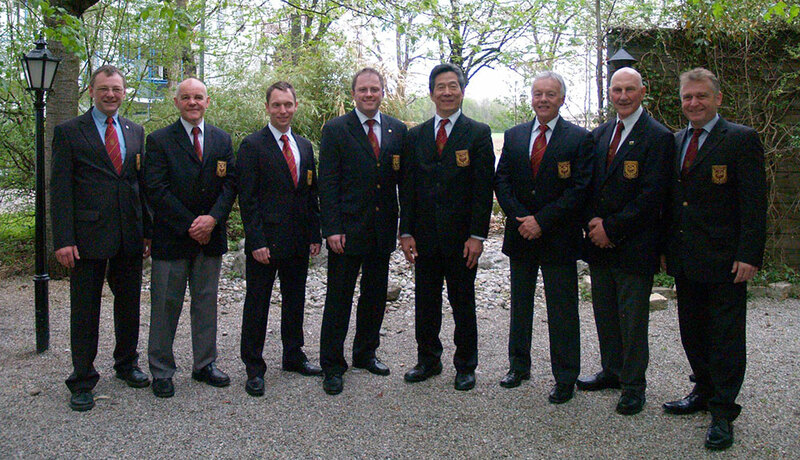 When the need for a gathering, a meeting, a seminar, at competitions as a Judge or Referee, or any situation when a Gi isn't either needed or appropriate, the SSU have an official uniform. It consists of Grey trousers/slacks, a Dark Blue Blazer, White shirt, Dark Red tie and dark dress shoes. The Blazer has the official SSU world crest on the left breast pocket and an official association tie with the crest of the front. Members can source their own Blazer, trousers and shoes but the Crest badge and tie need to be purchased from the association. Below are examples of the crest and tie. 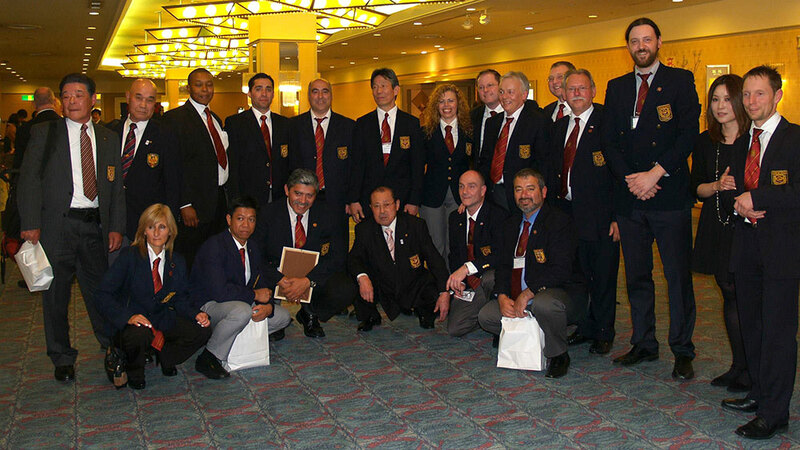 When all the country members of the SSU World Association meet it is good to see the unity and demonstration of Karate being one large family as in the word "Shukokai", which literally means "working together"and thus the term "The Shukokai" meaning one being big group or like minded people.